War on Women: The Abortion Battle. Nadine Dorries has secured a 90 minute debate spot on abortion on Wednesday October 31 at 9:30. She is asking for the limit for abortions in the UK to be reduced from 24 weeks to 22 weeks. This is just a debate. There will be no vote, however, Dorries is using this as the second stage of her attack on abortion rights. Her next stage is a full parliamentary debate in the Spring of 2003 where Dorries would like to decrease the time limit on abortions to, at the most, 20 weeks. Considering the support Dorries already has from the Health Secretary Jeremy Hunt, this is quite clearly a concerted attack on women’s bodily autonomy. 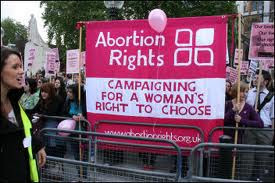 Women in the UK already do not have the right to abortion on demand. Women in the UK need greater access to abortion without judgement. We can not allow Nadine Dorries continue her War on Women’s bodies. Please write to your MP today to ensure that they vote to keep the abortion limit at 24 weeks. There is an excellent form letter available here on Edinburgh Eye’s blog. Petition here to end the legal requirement for two doctors signatures for a woman to access an abortion. Next Next post: It is the End of Feminism.